Hornbill Festival had been on our bucket list for a long time. The desire to see the tribes, know more about their culture and a fascination towards their way of living drew us to Nagaland. 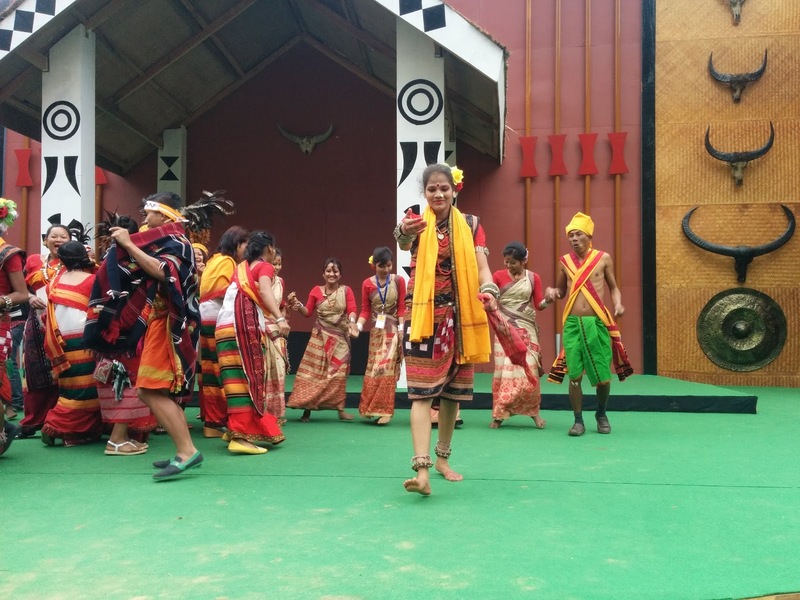 We definitely were fortunate to have been a part of the celebrations of the festival of festivals- Hornbill. The 2015 Hornbill festival started with great extravaganza and you can hear the folk songs, the beats of the log drums and war cry of the tribes at the parking of Kisama Village, the venue for Hornbill. This festival not only provides an insight to the Naga tribes and culture but also gives an insight to the culture of all the other North Eastern states as well. These 10 days are more of celebrating life with an understanding of tribal heritage and getting a glimpse of the diverse cultures and cuisines of North East India. The best 10 days that you can live witnessing their indigenous games, listening and dancing to their music and folk songs. It is more like attending a wedding where food and drinks are in abundance, music and dance to keep you entertained with everyone dressed in their traditional best and of course laughter all around. Hornbill festival not only unites the tribes of North East India but also whole of India. Artists from different part of India bring in their culture and celebrations. Cultural artists from Andhra had put up a great show and won the hearts of thousands of people in the audience. Any musical and cultural festival in India is definitely not complete without Punjabi Bhangra dance and here too Bhangra was saved for the last and the friendly North East folks too tried their hands at it. After the cultural shows were wrapped up there was a fusion by all musicians and at that moment we understood why musicians across the globe are idolized by millions. The entire crowd was welcomed on stage and had their dancing shoes on. Music surpassed all communication and language barriers and untied people from all parts of the World to beat to one tune. The true essence of a festival- celebration of life could be captured in that one moment. An entire day during the Hornbill is exclusively dedicated to Naga culture. Each of the 16 tribes portray their folklore and culture through dance, music or performances. The small Kisama heritage village comes to life and showcases the awesome features of the 16 Naga tribes. Each tribe has its own Morung where we saw men and women of the tribe dressed in their traditional attire. The Morungs are constructed in their unique and traditional way of that tribe displaying the artifacts and their way of living. Various cultural programs are performed to the delight of the visitors and visitors can even join them. One also gets to taste authentic Naga cuisine at each morung. Of course, no meal would be complete without gulping down the Naga rice beer from the traditional bamboo mugs. The artisans corner is a treat for outsiders and also provides an understanding of the skill required, the man-hours put in and of course the beauty of the end product. We got a peek into the authentic lifestyle of Nagas. Bamboo mat making and basket making which was earlier the domain of men and considered a taboo for women has now broken free from superstitions. The womenfolk of the Ao tribe have led the way in overcoming all barriers and turning this art into a means of livelihood. The Konyak tribe of Longwa village are master metal craftsmen, they are renowned for metal craft-ware using wax process technique. Salt extraction- Peletkie Village in Peren is famous for its mineral salt extraction. The locals extract salt from mineral springs using indigenous techniques. The whole procedure involves continuously boiling spring water for 3 nights and 4 days and a total of 100 baskets of firewood is required to extract 40 cakes of mineral salt. The salt is believed to have medicinal properties and is widely used for rejuvenation. Right next to the artisans corner is the World War II Museum, an ideal place for history buffs. The World War II Vintage Car Rally organized by the Nagaland Adventure and Motor Sports Association is a showstopper and the mecca for Vintage car enthusiasts. Vintage Willys rally started from Dimapur and culminated at Kisama. They did their best to give an authentic feel of World War II with men dressed in army uniforms of different nations armed with prop guns. Apart from the cultural programs, there is a culinary competition, adventure sports competition, literature festival, photo competition and indigenous competitions such as wrestling, fire eating, and the most anticipated Naga Chilli eating competition. Kisama Village also has numerous stalls and you can pick up a range of products. From wooden handicrafts to hand looms to herbal and organic products. Exceptionally well made handcrafts are on sale. There are several amazing artifacts to choose from and one would be spoilt for choice. The floral and agricultural galleries are total stunners. The most amazing part about this was the stall promoting the 'Hydroponics' system which is nothing but soil less farming. Organic and fresh fruits and vegetables are up for sale. The amazing fragrance was so inviting that one yields to the temptation of trying a kiwi or orange immediately. For music lovers, renowned bands from different countries and states perform at the hockey grounds. These concerts are the perfect way to end the day on a high note. 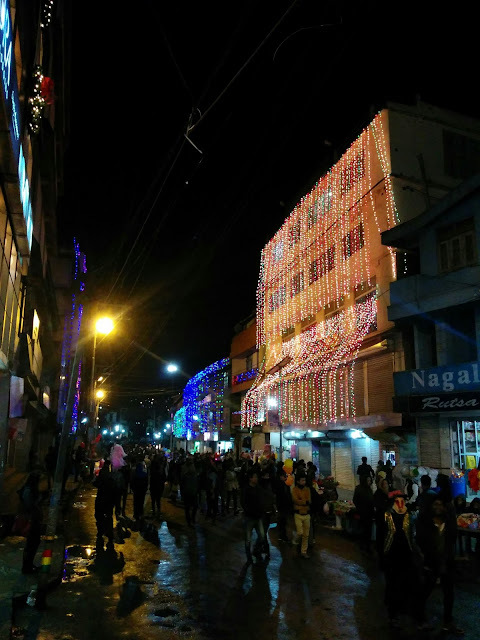 The night carnival sets off the party side of Kohima. Vehicles go off the road and in place comes hundreds of stalls selling clothes, household items, flowers, toys, colorful face masks, temporary tattoos and of course several food stalls that sell authentic Naga delicacies. We were exposed to a whole new level of non vegetarian cuisine in Nagaland. 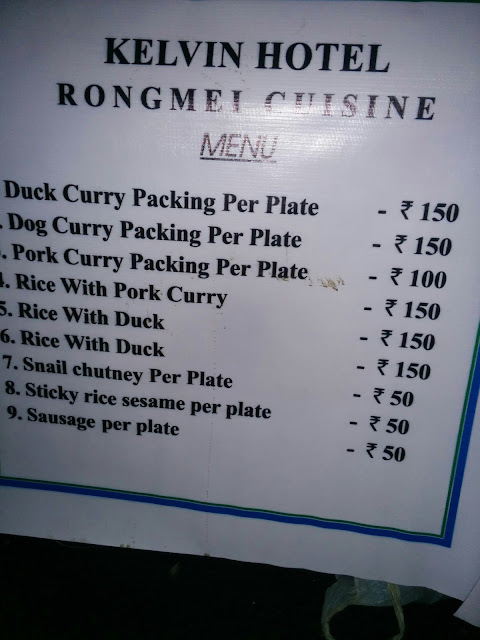 Ranging from pork, beef, snail and plenty of insects and worms on the menu, dog meat is also preferred and loved by the Nagas. Food is celebration of life and everyone has their own tastes, it is incorrect to judge anyone on any basis especially on their food habits. Sadly, the society and even the government in some cases seem to have a say on what people should or should not eat. In this century living in a free country and you cannot choose what can be on your plate. While there are just a handful of options to stay in Kisama, Kohima which is only 12 km from Kisama, has tons of options to suit all budgets. It is pretty easy to commute as well, one can either hire a taxi or travel with the locals like we did in the city bus to PR hills and from there shared taxis ply to Kisama at Rs.50 per seat. More picture from Hornbill Festival. Glad to help. Hope you visit next year :) and share your experience. Hornbill festival is celebrated from December 1 to 10 every year. Do you have any idea about some budget friendly places to stay in Kohima? Not sure about a place for under 500 INR, we stayed in Hotel Aurora on traders road a double room costed us 900. Have a good trip.